Our family has had the opportunity to spend time with some local musicians for a few months now, learning the Sakalava language and culture and discovering their musical talent. Ladis, the lead singer, is the oldest son of our home-stay father, Papa Armand (the post from last New Years shows Papa with a huge smile, holding the turkey and chickens above his head with pride). 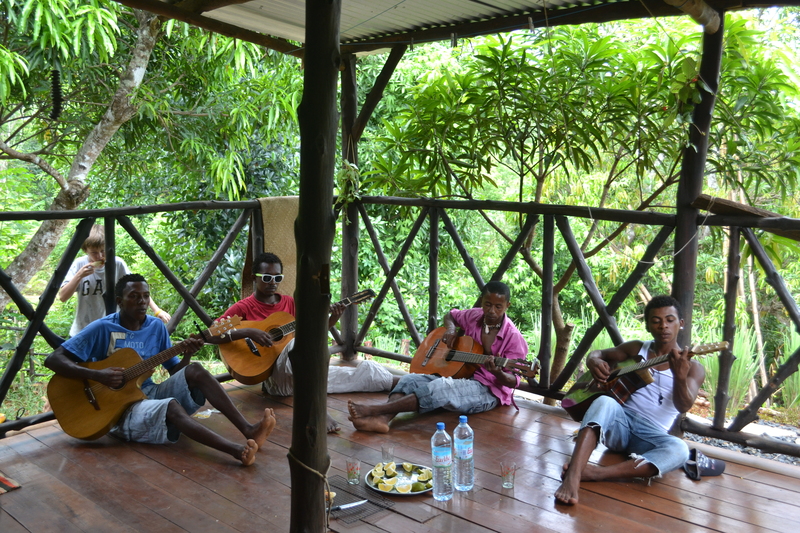 Matis plays lead guitar, Edme plays backup with a traditional Malagasy guitar, and Fabio and Lino play percussion. Since Rebe began learning to play the guitar last October, our new friends have encouraged her along the way. She admits that their African rhythms are brilliant, and that there’s a sharp learning curve between Sakalava music and, “It is Well, With My Soul”. As a family we have chosen to encourage and empower their musical makings. Most Saturdays they visit our house, relax on our deck, play music and share a meal with us. It’s been a blessing to build these friendships and they have been generous in sharing their knowledge of the local culture (especially the culture of the younger generation) with us. They often play music at local ceremonial rituals, and many of their songs deal with traditional culture and values, including the honoring and veneration of their ancestors. We have had several occasions to learn about their understanding of God and spirituality and share the truth of the Gospel. They have many points of connection, like their belief in a Supreme Creator, that we have been able to build on. Please pray for these guys as they are eager to understand who they are in light of who God is. Awesome! Love the sound. What a ‘God inspired’ opportunity. I agree, Mom. This idea is from the Lord…love you. I have been sharing your updates with her for some time and she is faithful to pray for you and your ministry daily. I am encouraged in my personal walk with your updates and we will continue to pray for you all as you serve our awesome God! Hey Jan! Thanks for the encouraging words and for the prayers. I would love for Aunt Norma to get our updates… we can’t add her to the list, though. All she needs to do is go to our website (www.mcreynoldstribe.com) and enter her email at the bottom left of the homepage, under the heading “follow our blog.” Once she does that, she will receive an email every time we post something. It is good to hear from you, please say hello to everyone up there! Thank you for sharing! God is at work before our very eyes. Wow thanking god with you- thanks so Much for including the song. Praying for your music guys and in awe how god is using you all to influence culture by partnering w local musicians. So awesome!!! Keep looking up- May The Lord continue to hold you fast and tight and renew you each day in his goodness love and grace. Praying for your kiddos. It’s so great to hear from you Suzanne…give the family and the church our love. We miss you guys. We’re excited to see what God is up to with the relationships we’ve formed with these talented friends and musicians. Grace and peace, sister. Wow, that was so beautiful! God is good all of the time. God is good. We praise God for your encouragement and prayers…blessings, sister. This is SO AWESOME! What a surprising, beautiful, way for the LORD to bring his words to a people. Thank you for opening your porch, your food, and your creativity to the these young men, and for following the always-ingenious ways of the holy spirit. I love you guys. So eager to come for a visit. We’re always so encouraged by your blog posts! How exciting that the gospel is spreading through music! I’d like to use this story and photo on http://www.mtw.org/news and on our Facebook page. Any objections to that? beautiful music! praying for you and the sakalava people! We thank you for your continued prayers and encouragement. It’s pretty amazing what God is doing through music and translation! His Word is on the move and we are thrilled to be part of His plans in Madagascar.